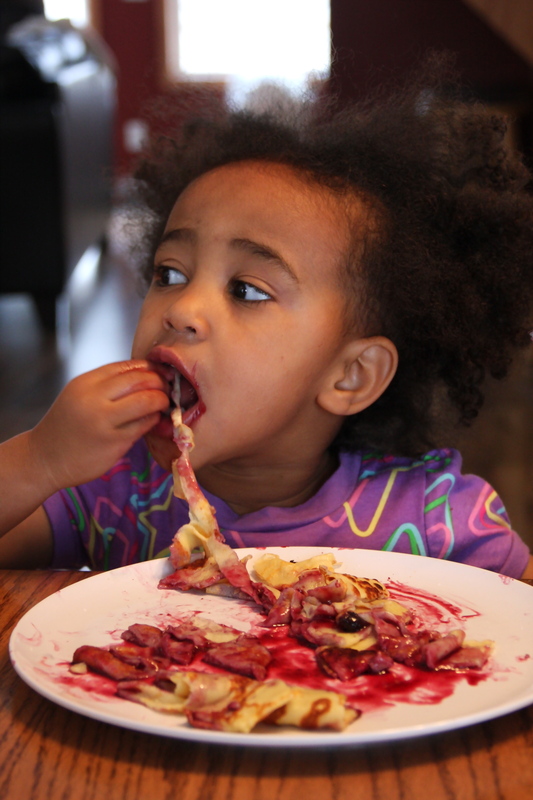 This weekend, I had the pleasure of cooking up some yummy treats with the youngest of the kitchen helpers in the fam. Saturday night, my little sister Chloe wanted to make cupcakes, since I brought her some snowman cupcake papers that I found on clearance after Christmas. So we went the quick and easy route with a cherry cake mix tucked away in the pantry and some easy homemade cream cheese frosting (cream cheese, vanilla, and powdered sugar). 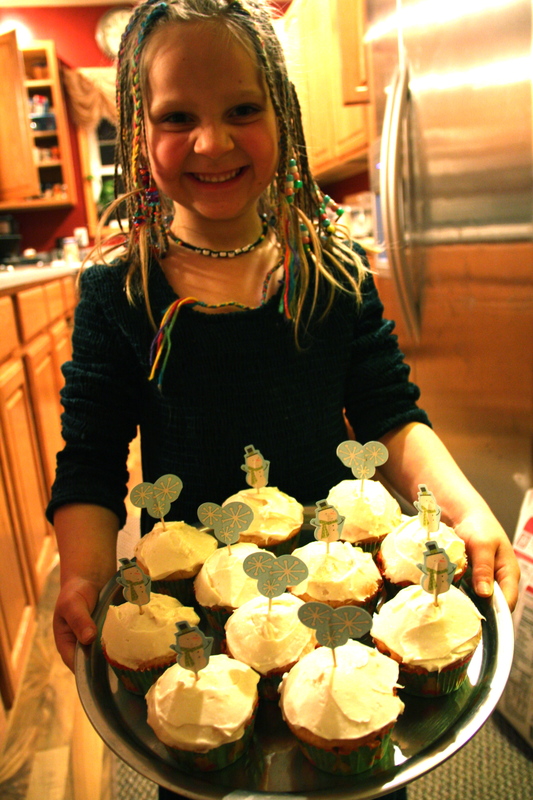 She was pretty proud of her fancy cupcakes. We also whipped up this little piece of heaven for those of us more chocolate-ly inclined..sadly it was scarfed down without thought to taking a picture of it in all its deliciousness. 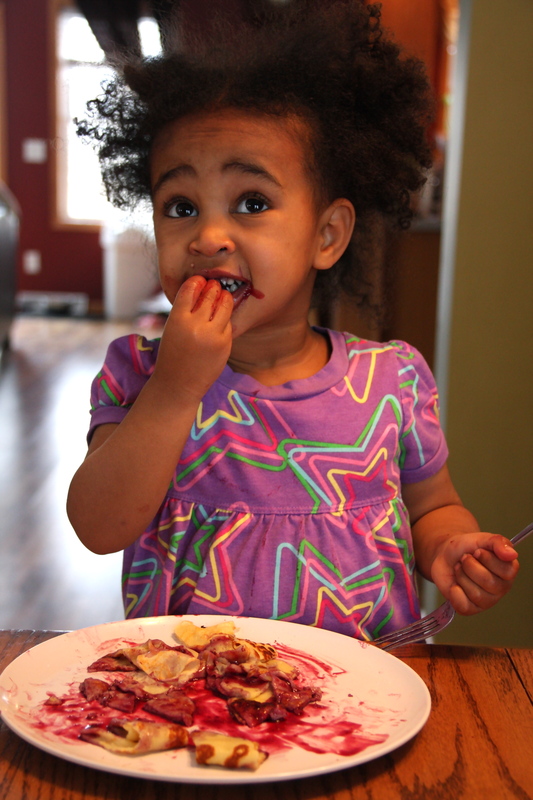 Sunday morning I was talked into making one of my specialty treats – crepes. 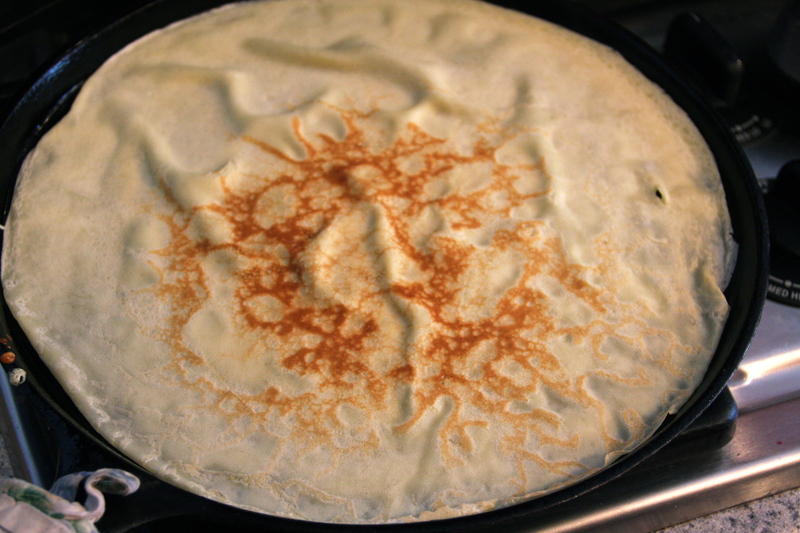 Now, you have to believe me when I say this – crepes are not that hard to make. I promise! Time consuming, yes. Difficult, no. Here’s the recipe I use from Stolen Moments Cooking – the directions are really thorough, so there is no need for me to rehash them here. 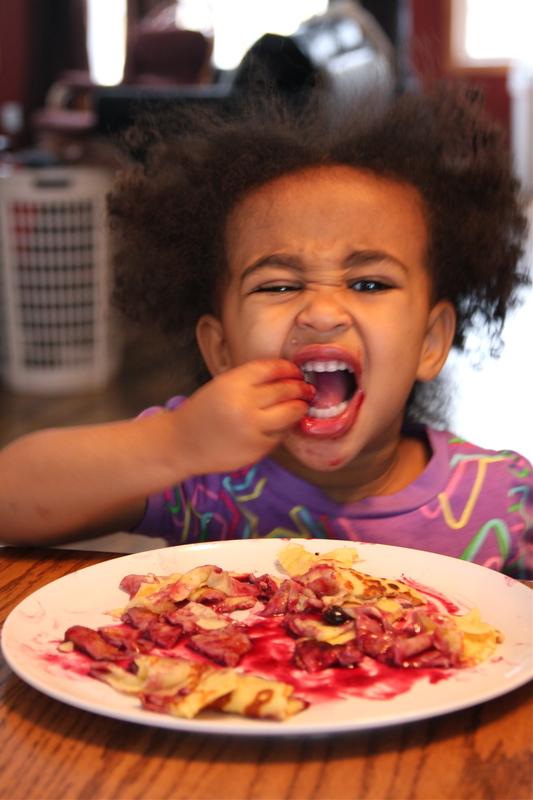 This time I had the pleasure of cooking with the newest addition to the family, 2 1/2 year old Amayah Tihun. She came home from Ethiopia only three weeks ago and is doing great adjusting to being a part of the fam. 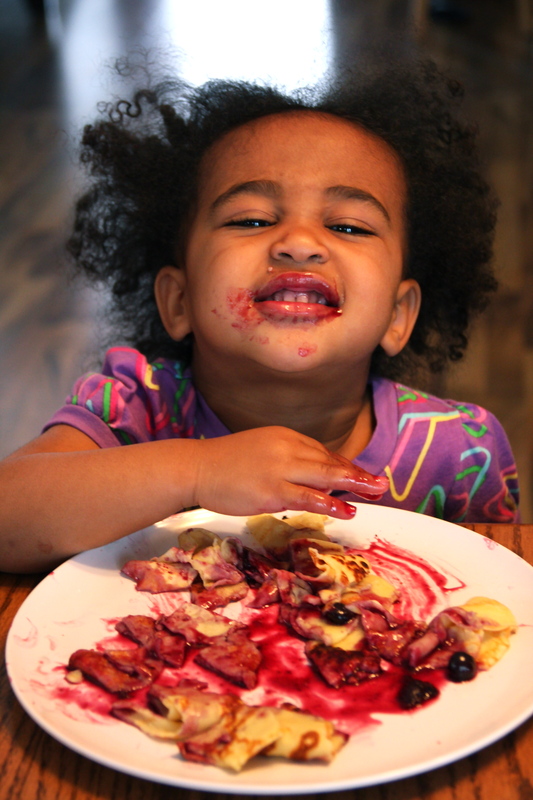 As you will see below, she thoroughly enjoyed the fruits of her labor. This was the first time that I tried making crepes on a cast iron skillet instead of a non-stick pan. I was very pleased to find out that it worked wonderfully – it helped that the pan was very well seasoned. I wouldn’t try crepes on a non-seasoned cast iron pan. It also made it a little more difficult to spread the batter around, since cast iron is so heavy, so I might use a non-stick pan if it is your first time making them. With so many crepe loving people to feed, we decided to make them giant sized! 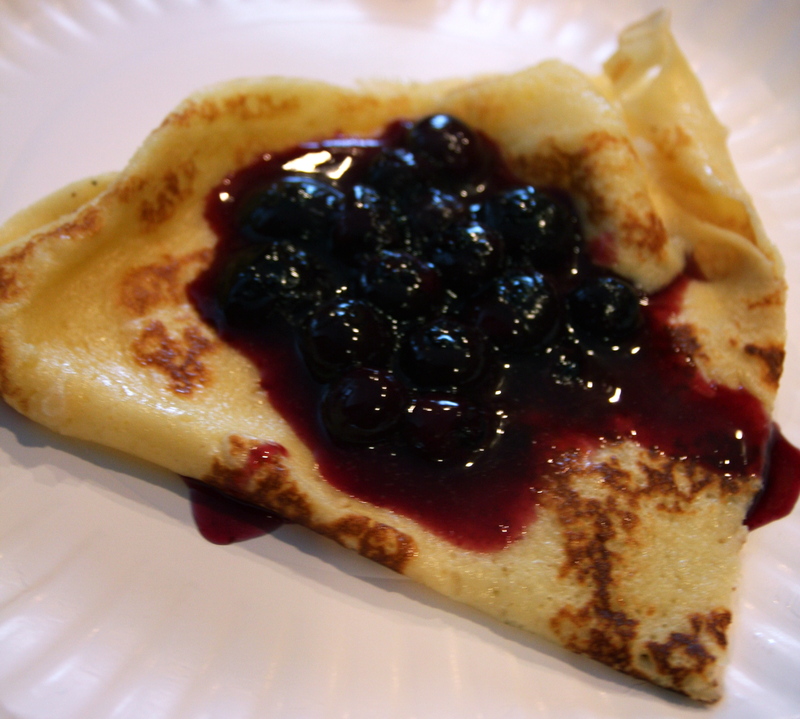 Topped off with a little blueberry sauce (frozen blueberries warmed on the stove with a little sugar and cinnamon – mix a scoop of cornstarch with cold water and add to the boiling blueberries to thicken the sauce a bit) these crepes were quite deeelicious! Hope you had just as great of a weekend as I did! PS Thanks to Brenda for filling in for my Soup Sunday post – sounds tasty. Those crepes look amazing! I’ve eaten plenty of them in my day, but never had the guts to make them myself. There’s always a first time for everything though, right? Sounds like a good Saturday-morning-breakfast idea! P.S. – What great pictures! Cute kids! Yeah…I also stole my moms camera for the weekend …it takes such great pictures! Finally made ’em! Whew they were good!